"Experimental Psychology and the Laboratory in Toronto"
1. At first glance, Albert Holden Abbott's article, "Experimental Psychology and the Laboratory in Toronto," appears to be little more than a description of the lab established by James Mark Baldwin in 1891, and expanded by August Kirschmann in the years after Baldwin's hasty departure from Toronto in 1893. Being the first experimental psychology lab in the British Empire (Baldwin, 1892, p. 144; 1930, p. 3), this alone might make it of interest to historians of psychology. But it contains much more. The bulk of the paper is occupied not with a description of the lab and the activities it made possible, but rather with an extensive justification and defense of experimental psychology itself. Abbott's article tells us, simply by the topics on which it dwells, that experimental psychology -- though explicitly established by Wundt in 1879, and with roots dating back at least to the psychophysical experiments of Weber and Fechner and the physiological work of Helmholtz -- was still not widely accepted in the turn-of-the-century academic community; at least not that of Toronto. The main aim of this Introduction is to set the article in its various contexts: political, social, institutional, and intellectual. These will tell us something of why Abbott chose to write it in the way he did, foregrounding certain topics, backgrounding others, and ignoring entirely some issues that may seem important to us today. 2. In 1900 Toronto was a city of about 200,000 residents, and it was growing rapidly. By annexing adjacent towns and villages it had doubled in geographical size over the previous 20 years. Politically, Scottish Protestant interests were predominant, as they were throughout much of English Canada at the time. Ontario, the province of which Toronto was the capital, had been governed by the Liberal Party since 1871. After 24 years under the Premiership of Oliver Mowat, and 3 more under Liberal Arthur Hardy, another Liberal, George W. Ross, had become Premier in 1899. By contrast, the Canadian Government had been dominated by John A. MacDonald's Conservatives since 1867 (excepting a 5-year Liberal hiatus in the mid-1870s). Times were changing, however. Poltical instability in the wake of MacDonald's death in 1891 (followed by four different Prime Ministers in five years) had given the Liberals, led by Wilfred Laurier of Québec, the opening they needed. They were elected in 1896, making Laurier the first French-speaking Prime Minister in the country's short history. In 1900, the year of Abbott's article, the Laurier government was re-elected. 3. The University of Toronto originated in 1843 as an Anglican institution named King's College. 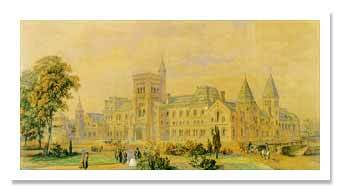 In the early 1850s, the religious affiliation was dropped and the institution was reorganized in an effort to attract other colleges: "University of Toronto" was assigned the degree-granting powers, but the instructional curriculum was controlled by "University College." Under this arrangement, the University of Toronto was gradually expanded by federating University College with other nearby universities of various religious affiliations -- first Knox (Presbyterian) and Wycliffe ("Low" Anglican) in 1887, then Victoria (Methodist) in 1892, Trinity ("High" Anglican) in 1906, and St. Michael's (Catholic) in 1910. McMaster (Baptist) and Queen's (Presbyterian) had refused government pressure to federate. Religion was a "hot" topic, coloring debate on virtually every issue on campus. The debate over the appropriateness, and even the possibility, of experimental psychology was no exception. 4. Toronto's Department of Philosophy, where Abbott studied, had recently emerged from a series of crises. In February 1889, George Paxton Young, a moral philosopher influenced by British Idealism who had been the philosophy professor for nearly two decades, died suddenly (see, e.g., Kenwood, 1999; Slater, forthcoming; Stevenson & Mathien, 1988; Tolman, 1996). Toronto's influential contingent of "Canada First" nationalists -- which included among its ranks George W. Ross, then Ontario's Minister of Education -- demanded that Young be replaced by a Canadian; some even went so far as to insist that Young's successor be a University of Toronto graduate. No suitable candidate fulfilling this "qualification" being readily available, the "nativists" seized, in their zeal, upon a recent undergraduate student of Young's, James Gibson Hume. Hume was just completing his Master's degree at Harvard, having spent the previous year at Johns Hopkins in Baltimore. Hume would later claim that Young had sent him there to learn the new experimental psychology from G. Stanley Hall -- Wundt's first American student, founding editor of the new American Journal of Psychology, and future founder of the American Psychological Association -- with the intention of having him hired back to Toronto to teach the subject. Things did not work out this way, however. Hall was on his way out of Johns Hopkins to take over the reigns of the newly established Clark University in Worcester MA, and it appears that Hume only learned about experimental psychology from him without obtaining any practical training. Rather than going with Hall to Clark, Hume moved on to Harvard, studying with William James, Josiah Royce, and especially Francis Peabody. There is no evidence that he gained any hands-on experimental training at Harvard either. With Young's death, the allegedly promised position at Toronto became a questionable proposition. 5. Daniel Wilson, the powerful President of University College, was not sympathetic to the "nativists," and wanted to hire instead a young professor then at Lake Forest College in Illinois recommended by the Principals of both Knox and Wycliffe Colleges: James Mark Baldwin. Baldwin had taken Ph.D. under Scottish realist James McCosh at Princeton, and had briefly studied experimental psychology in Wundt's Leipzig laboratory. He also had to his credit the publication of the first volume of his Handbook of Psychology (Baldwin, 1889, 1891). In short, his credentials were far superior to those of Hume. Nevertheless, the "nativists" were relentless in their personal attacks on both Baldwin and his supporters. Letters were published in the newspapers. Presentations were made before the Ontario Cabinet. The controversy went on well into the new school year, preventing anyone from being selected to replace Young. Finally a compromise was brokered in the cabinet of the Ontario government under which which Baldwin was appointed the portion of Young's position related to Metaphysics and Logic, and Hume received the part related to History of Philosophy (though this had never been in Young's title), combined with a newly-created Ethics position at University College. Hume was also given two years of paid leave, at his own suggestion, in order to obtain a Ph.D. He attended Albert-Ludwig University in Freiburg, where (once again) he was expected to acquire expertise in experimental psychology. His dissertation, however, was entitled Political Economy and Ethics, and his closest relationship seems not to have been with Hugo Münsterberg -- a former student of Wundt's and the future director of the Harvard Psychology Laboratory -- but rather with an ethicist by the name of Alois Riehl. Hume returned to Toronto to take up his teaching duties in 1891, but he would never teach or conduct research on experimental psychology during the course of his long career (see T.L. Hoff, 1992; Slater, forthcoming). 6. In the meantime, Baldwin was setting up at the University of Toronto. A fire gutted the University College building in February 1890, but this gave him an opportunity to establish a working psychology laboratory in the rebuilt College building in 1891 (see Baldwin, 1892; Pantalony, 1997). Mostly the lab was used for class demonstrations under Baldwin's directorship. In 1892, Baldwin sat on the original organizing council of the American Psychological Association (APA), and served as discussant on a number of papers (including Hall's Presidential Address) at the APA's first annual meeting at Clark University. In 1893, Baldwin received permission to hire an assistant, August Kirschmann, who was then working in Wundt's Leipzig lab. By the time Kirschmann arrived, however, Baldwin had resigned in order to take up a position at Princeton, where he would co-host the third annual APA meeting in 1894. As a result, Kirschmann was made de facto director of the psychology lab. 7. In 1895 Kirschmann appointed a senior student to be his new laboratory assistant: Albert Holden Abbott, who would later author the article to which the present essay is an introduction. Abbott graduated with his BA that same year, but he stayed on to continue assisting Kirschmann in the lab. The first major publication based on research from the Toronto lab appeared in 1895 as well (Robinson, 1895). Although Kirschmann supervised this work, his own major Toronto publication premier came a year later (Kirshmann, 1896). In 1898, Abbott was promoted to the position of "Instructor," and work began on a "Psychological Series" of the internal publication University of Toronto Studies. In 1900 Abbott published "Experimental psychology and the laboratory in Toronto," in a local magazine, University of Toronto Monthly. The reason behind its composition is not entirely clear. Did Abbott write it on his own initiative? Did Kirschmann ask Abbott to write it in order to publicize the existence of the lab? Did someone in the University Administration or on the Editorial Board of the Monthly ask Kirschmann or Abbott to write it? We do not know. What is clear is that it was written with the awareness firmly in mind that many people remained skeptical about the possibility of experimental psychology. The article consists largely not in a description of lab activities, as one might expect; that topic occupies just the last few pages. The main goal appears to have been to defend the viability of experimental psychology against two main groups of opponents: those who believed that psychological questions could not be the subject of a proper science, and those who believed that they could but that this was within the purview of physiology. Abbott clearly and unhesitatingly repeats the standard defenses of experimental psychology that had been developed by Wundt and his students over the previous quarter-century: (1) certainly some psychological processes can quantified and experimented on (e.g., Weber's and Fechner's psychophysical studies), and (2) physiology may study the bodily activities correlated with psychological processes (e.g., neural activity in the retina or cochlea), but not the character of the psychological experience itself (e.g., seeing a color or hearing a tone). Only experimental psychology does the latter. 8. Abbott would be promoted to "Lecturer" in 1901, and then go to Würzburg, where he would earn his Ph.D. in 1904 apparently under the supervision of Oswald Külpe. He was raised to "Associate Professor" at University of Toronto in 1906, and became de facto director of the lab when Kirschmann left for Germany in 1908. 9. In 1919, however, he was featured in the Varsity, the local student newspaper, for claiming to have held conversations with the spirits of Coleridge, Spinoza, and Plato, via a local medium named Louis Benjamin. Surprisingly, Plato was reported to have said, among other things, that "he had written the Republic as a satire on the government of Athens." Abbott went on leave from the University the following year and never returned. His academic career cut short, he turned full-time to charitable work he had begun during World War I, becoming Secretary of the Canadian Red Cross. He suffered a nervous breakdown in 1924, which led to his resignation from the Red Cross in 1926. He died in 1934. 10. Kirschman became chronically ill while on paid leave in Germany in 1908, and never returned to North America. His salary was gradually reduced by the University, and finally cutoff in 1915. He was appointed Assistant Director of the Leipzig Psychological Institute in 1917, where he worked until his retirement in 1931. He died in 1932. 11. Hume became the Head of the Philosophy Department after Baldwin's 1893 departure and continued in that position until 1926. He published little original scholarship (Hume, 1891, 1894, 1907, 1922), but he often gave public speeches in favor of prohibition, in favor of regularizing English spelling and pronunciation, and warning of the threat he believed to be posed by the presumed militarism of German culture. In a 1924 lecture to the Toronto Lyons Club, he claimed that philosophy would ultimately put an end to war. In another address to a Christian students conference in Indianapolis the same year, however, he argued against the proposition that war is necessarily "unchristian," a position that stirred up contoversy in the local papers. Despite the "nativist" support for his initial appointment, in 1894 he became the subject of student complaints (published in the Varsity), and of a government investigation into his competence. In the ensuing report he was described as "not always clear though he appears to know his subject" (cited in Slater, forthcoming). Charges were raised against his competence again in 1904 (published in Toronto's Globe newspaper), but he was again cleared. After he retired, he became Chairman of the newly formed Canadian Prohibition Bureau. He lived until 1949. 12. Baldwin, of course, went on to become the leading developmental psychologist of his day (Baldwin, 1895, 1897, 1902). After going to Princeton in 1893, he was appointed to head the Johns Hopkins Psychology Department in 1903. He also co-founded Psychological Review with James McKeen Cattell in 1894, becoming sole Editor in 1904 (see Sokal, 1997). In 1908 he hired the young John B. Watson away from the University of Chicago, but later the same year Baldwin was forced to resign under a cloud of scandal. Baldwin later taught in Mexico and Paris. He died in Paris in 1934. Upon Baldwin's departure from Johns Hopkins, Watson, of course, became head of the Psychology Department there, and the Editor of Psychological Review. With these powerful tools at his disposal, he would lead the behaviorist "revolution" in North American psychology (see, e.g., Watson, 1913). Abbott, Albert H. (1900). Experimental psychology and the laboratory in Toronto. University of Toronto Monthly, 1, 85-98, 106-112. (Classics edition at http://psychclassics.yorku.ca/Abbott/). Abbott, Albert, H. (1904). Psychologische und erkenntnistheoretische Probleme bei Hobbes [Psychological and epistemological problems in Hobbes]. Würzburg: Julius-Maximilians-Universität. American Psychological Association. (1893). Proceedings of the American Psychological Association. Preliminay Meeting: Clark University, Worcester, Mass., 1892; First Annual Meeting: University of Pennsylvania, Philadelphia, Pa., 1892; Second Annual Meeting: Columbia College, New York, N.Y., 1893. New York & London: Macmillan. (Classics edition at http://psychclassics.yorku.ca/APA/). Baldwin, J. Mark. (1891). Handbook of psychology: Feeling and will. New York: Holt. Baldwin, J. Mark. (1897). Social and ethical interpretations in mental development. New York: Macmillan. Baldwin, J. Mark. (1902). Development and evolution. New York: Macmillan. Baldwin, J. Mark. (1930). James Mark Baldwin. In C. Murchison (Ed. ), History of Psychology in Autobiography (Vol. 1, pp. 1-30). Worcester, MA: Clark Univeristy Press. (Classics edition at http://psychclassics.yorku.ca/Baldwin/murchison.htm). Hoff, Joan Whitman (1995). Crisis of Canadian identity as explored through Canadian philosophy. Lock Haven International Review, Issue 9. Hume, James G. (1892). Physiological psychology. Minutes of the 32nd annual conveniton of the Ontario Teachers Association. Toronto: Hill & Weir. Hume, James G. (1894). Socialism. Knox College Monthly, 14, 601-614, 661-674. Hume, James G. (1907). Evolution and personality. University of Toronto Monthly, 8, 130. Hume, James G. (1910). Abstract of "The significance of suicide" (presented at the convention of the American Philospohical Association at Yale University in Dec. 1909). Philosophial Review, 19, 179-180. Hume, James G. (1922). Evolution and personality. In Philosophical essays presented to John Watson (pp. 298-330). Kingston, ON: Queen's University Press. Kenwood, Christine. (1999). The anti-sceptical psychology of George Paxton Young. History and Philosophy of Psychology Bulletin, 11 (1), 4-10. Kirschmann, August. (1895). Remark on the foregoing article [Tracy, 1895]. American Journal of Psychology, 7, 23-25. Kirschmann, August. (1896). Color-saturation and its quantitative relations. American Journal of Psychology, 7, 386-404. Pantalony, David. (1997). Brass instrument psychology at the University of Toronto. Sponsored by the University of Toronto Museum of Scientific Instruments. Pols, Hans. (1999). The world as laboratory: Strategies of field research developed by mental hygiene psychologists in Toronto, 1920-1950. In Theresa R. Richardson & Donald Fisher (Eds. ), The development of the social sciences in the United States and Canada: The role of philanthropy (pp. 115-141). Greenwich, CT: Ablex. Robinson, Thomas R. (1895). Fechner's paradoxon. American Journal of Psychology, 7, 9-23. Robinson, Thomas R. (1896). Light intensity and depth perception. American Journal of Psychology, 7, 518-532. Schopenhauer, A. (1901). The wisdom of life, and other essays by Arthur Schopenhauer (Bailey Saunders & Ernest Belfort Bax, Trans.). New York & London: M. W. Dunne. Slater, John. (forthcoming). Philosophy at Toronto. Sokal, Michael M. (1992). Origins and early years of the American Psycohlogical Assication, 1890-1906. American Psychologist, 47, 111-122. Sokal, Michael M. (1997). Baldwin, Cattell, and the Psychological Review: A collaboration and its discontents. History of the Human Sciences, 10, 57-89. Stevenson, J.T. & Mathien, T. (1988). George Paxton Young: Sceptical fideist. In J.D. Rabb (Ed. ), Religion and science in early Canada (pp. 141-154). Kingston, Ontario: R.P. Frye. Tolman, Charles W. (1996). Opposition to the ideal system as leitmotif in nineteenth century Anglo-Canadian psychology. Canadian Psychology, 37, 137-144. Tracy, Frederick. (1893). The language of childhood. American Journal of Psychology, 6, 107-138. Watson, John B. (1913). Psychology as the behaviorist views it. Psychological Review, 20, 158-177. (Classics edition at http://psychclassics.yorku.ca/Watson/views.htm). To be completely fair, soon after returning to Toronto, Hume (1892) delivered an invited lecture to the Convention of the Ontario Teachers' Federation entitled "Physiological Psychology." Although he demonstrates a basic knowledge of the experimental psychology of his day, in large part the piece is an extended critique (fairly conventional for its day) of the "limited" materialist presuppositions he took to be inherent in the scientific approach to psychology. As such, it cannot really be regarded as a contribution to the discipline of psychology. He condemns physiological psychology for being unable to account for the "unity of consciousness" or for what he calls "moral facts." By contrast, he claims that the "old psychology" does not suffer from these shortcomings, though he never explains how it accounts for these, rather than merely accepting them a priori. He also argues that physiological psychology inevitably leads to agnosticism, which he seems to take to be a self-evident argument against it. He repeatedly refers to the "narrowness" of science, and contrasts this with the "depth" of traditional philosophy. One can only wonder what Hume's reaction must have been when he read Abbott's dismissive rejection of "the still too often heard, but nevertheless nonsensical opinion, that an Experimental Psychologist must be a Materialist in Philosophy" (Abbott, 1900, p. 108). Interestingly, Hume was virtually a charter member of the American Psychological Association (1893), the early membership of which included a number of traditional philosophers of mind as well as adherents of the "new" psychology (Sokal, 1992). Thomas R. Robinson earned his BA in classics and philosophy at Victoria College in 1895, but he worked in the psychology lab a great deal. Rather than continuing his psychological studies (Robinson, 1895, 1896), however, he went on to a theological degree at Knox College. After a few years in the field as a student-pastor, he returned to the University of Toronto, earning a Ph.D. in psychology in 1906. He stayed on teach psychology, and later ethics and apologetics, eventually rising to the level of Associate Professor. He also gave public lectures against the dangers of immigration by those who, as he put it, could not easily be "Canadianized." In 1927, he was elected President of the Social Service Council of Canada which sought, among other things, to censor "immoral" aspects of vaudeville shows. Robinson retired in poor health in 1930 and died in 1934 of a heart attack. 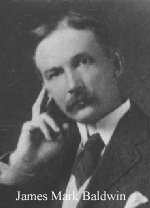 According to Garvey (1929), the Toronto lab's first publication was authored by Frederick Tracy (1893), a one-time student of Young's and assistant to Baldwin. This misinformation was probably given to Garvey by E.A. Bott, who was then head of the new Toronto Department of Psychology. 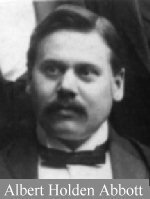 Although Tracy had worked in the Toronto lab after earning his BA under Young in 1889, by 1893 he was working on his Ph.D. under Hall's supervision at Clark University. The observations reported in Tracy's article seem mostly to have been made during his tenure at Clark, though he reports the project as having been suggested by Baldwin while he was in Toronto (1893, p. 134). Even the data that was from Toronto was probably not collected in the lab, but rather in the homes of the children whose language was being studied. After his Ph.D., Tracy returned to Toronto as an Assistant Lecturer and continued to teach at Toronto for many years. His book, Psychology of Childhood (1893), became a standard text in the field. See footnote 5 for further details of his career. The first issue, published in 1900, consisted of an article by a former student named Wilmot Burkemar Lane (B.A. 1893, M.A. 1894), who had since gone to University of Wisconsin to earn his Ph.D. in 1899 under Joseph Jastrow (only Jastrow's second Ph.D. supervision). After teaching at small colleges in Ohio and Virginia, he would return to Toronto in 1912, taking up a position in ethics at Victoria College. Lane retired in 1939 and lived until 1960. The Table of Contents of Volume 1 of the "Psychological Series" is shown to the right. Notice in particular that one of the articles was written by a woman, Emma S. Baker. She was the first person to earn a Ph.D. in psychology at Toronto, and would go on to become Principal of a number of colleges, including Mt. Allison in New Brunswick, and Maryland College for Women in Lutherville, Md. Volume 2 of the "Psychological Series," published in 1907, included an article by Oswald Külpe of Würzburg, who had been Abbott's Ph.D. supervisor. 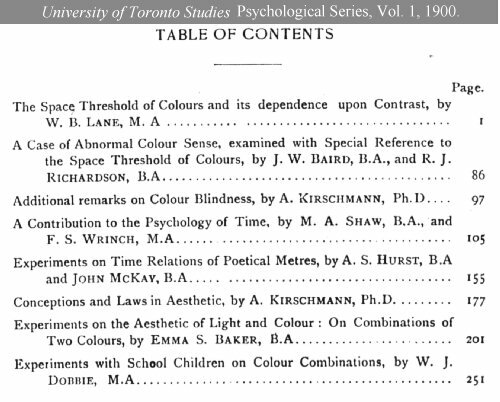 After Kirschmann left Toronto, the series published only sporadically, including two articles in Volume 4 (1920) by E.A. Bott who would go on to head the Psychology Department for nealy 30 years (see footnote 5). At the start of his dissertation (Abbott, 1904), he thanks what he calls his "Lehrern" (teachers), Hume, Kirschmann, and Külpe, in that order. In his Lebenslauf (life story, roughly) at the end of the dissertation (pp. 137-138), he gives his "most heartfelt thanks" (meinen innigsten Dank) to both Külpe and Karl Marbe. The situation was actually quite complicated. As Head of Philosophy, Hume was technically in charge of the Psychology Laboratory, but he had neither the expertise nor the interest to exert any effective control over its activities. Kirschmann, the effective Director of Psychology, went on paid leave to Germany in 1908, and was expected to return the following year, but he became ill while away and would remain in Europe for the rest of his life. Frederick Tracy -- a one-time student of Young's who had been awarded a Ph.D. in psychology by Clark Univeristy (under the supervision of G. Stanley Hall) in 1893 -- returned to teach at Toronto and was rasied to the rank of Associate Professor in 1906. This is the same year that Abbott was given the same rank, but Tracy's promotion was made retroactive to 1905, giving him seniority over Abbott. In spite of this, Tracy had what was described in the local newspapers as a "nervous breakdown" at the end of 1907, and returned to teaching in the fall of 1908 still in poor health. George Sydney Brett, who would become Director of Psychology in 1921 and Head of Philosophy in 1926, had only just come to Toronto in the fall of 1908 as a Lecturer in Classics at Trinity College. Thus, Abbott appears to have been left more or less in charge of the psychology laboratory beginning with the 1908-09 academic year. Tracy suffered a relapse in 1911, and by the time he returned in 1912, his interests had turned almost completely to traditional philosophy. He was appointed University College Professor of Ethics in 1916. To fill out the story, after more than a decade of uncertainty, in large part because of the problematic situation with Kirschmann between 1908 and 1915, control of Psychology was taken away from the Philosophy Department in 1919, and Psychiatry Professor Charles Kirk Clarke was appointed Director of Psychology. In 1921 Clarke retired, and Brett was made the Director until Psychology became a Department in its own right in 1927. Edward Alexander Bott, who had been an Assistant Professor in Philosophy since 1917, was then made the Head of Psychology, a position which he held until 1956. During this period, the focus shifted from experimentation to participating in the "mental hygiene" movement (see Pols, 1999). Hoff (1992) lists among Hume's publications a book entitled Introduction to Schopenhauer (M. Walter Dunne & Co., 1900). Upon further investigation, this work appears to have been only an introduction written by Hume for a collection of Schopenhauer's essays, translated by two other individuals (Schopenhauer, 1901). A nationwide plebiscite on prohibition on 29 September 1898 barely passed (51% in favor). The margin of victory had been large in every province except British Columbia (where it was accepted by 54%) and Québec (where it had been defeated by a margin of over 4-to-1). However, because the voter turnout had been only 44% and the overall victory had been so slim, Prime Minister Wilfred Laurier (himself from Québec) decided not to proceed, arguing that only 23% of those eligible had actually voted for prohibition.